They say what happens in Vegas stays in Vegas. But here’s one thing that doesn’t belong in Vegas or anywhere else: ads that draw buyers in with eye-catching terms while burying the “gotchas” in fine print. In separate law enforcement actions, the FTC alleged that two Las Vegas dealers – car dealers, that is – didn’t play it straight with consumers. The complaint against Planet Nissan cites instances where the FTC says the company touted deals in prominent headlines, but then didn't clearly disclose key terms and major limitations on who qualified for the advertised price. 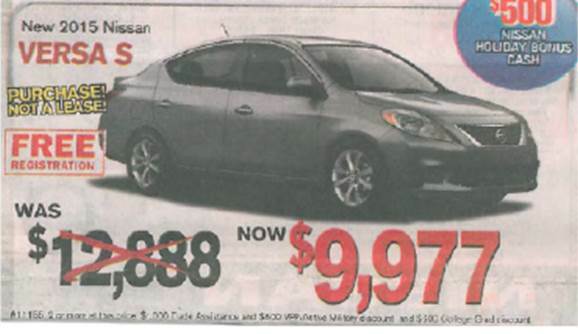 For example, Planet Nissan used bold red lettering to advertise a 2015 Versa as “NOW $9,977." But for most buyers, that price was a bluff because here’s what it said in small type underneath: "#11155, 2 or more at this price, $1,000 Trade Assistance and $600 VPP/Active Military discount and $600 College Grad discount." What did that mean? To get the advertised deal, buyers needed to qualify for a full house of separate rebate offers. In other words, they had to be active duty members of the military and had to be recent college grads and had to trade in a car. Everyone else had to ante up more. 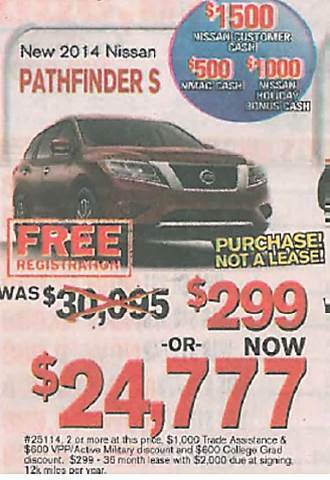 Another Planet Nissan ad touted a “NOW” price for a Pathfinder of $299 or $24,777 and featured the bold statement, “PURCHASE! NOT A LEASE!” But drop down to the bottom and buried in a block of text was this statement: “$299 – 36 month lease with $2,000 due at signing, 12K miles per year.” Were consumers able to reconcile the bright yellow “PURCHASE! NOT A LEASE!” tagline with a footnote saying $299 was a lease payment? Don’t bet on it. All advertised amounts include all Hyundai incentive/rebates, dealer discounts and $2500 additional down from your trade in value . . . 1.14MY Accent - *Price excludes tax, title, license, doc, and dealer fees. MSRP $18075 - $2451 Dealer Discount - $2650 HMA rebates - $4000 Trade Allowance = Net Price $8974. Lease 36 months with $0 Cash down payment. On approved credit. Must trade qualifying vehicle . . . All payment and prices include HMA College Grad Rebate, HMA Military Rebate, and HMA Valued Owner Coupon. Must be active military or spouse of same to qualify for HMA Military Rebate. Must graduate college in the next 6 months or within the last 2 years to qualify for HMA College Grad rebate. Must own currently registered Hyundai to qualify for HMA Valued Owner Coupon. Looking for a translation? According to the complaint, Planet Hyundai's $8,974 deal was available only to the demographically narrow niche of customers who could stack up three different discounts: the active duty military rebate, the recent college grad rebate, and the rebate for current Hyundai owners. So if Hyundai-owning Joe College who had traded his cap and gown for olive drab played his cards right, he might have qualified for the advertised $8,974 deal. But everyone else was out of luck. Other Planet Hyundai ads said “$0 down available.” Only after prospective buyers got to the table did they learn that “0 down” applied just to people who turned in a qualifying vehicle with a trade-in value of at least $2,500. The complaints offer other examples of how consumers were dealt a bad hand through deceptive ad claims and the companies’ failure to make required financial disclosures under the Consumer Leasing Act, Reg M, the Truth in Lending Act, and Reg Z. To settle the cases, Planet Nissan and Planet Hyundai have agreed to change the way they advertise. You can file online comments on the proposed settlements by July 29, 2015. What’s the message for other dealers? It’s unwise to use headlines to hype low rates or great deals while relegating key terms to small print or dense blocks of text. Lay your cards on the table by clearly explaining the nature of the offer up front. The same can be said for “deceptive door openers” – misleading come-ons that aren’t fully explained until the prospective buyer is already through the door. One final tip: When it comes to taking on deception in auto ads, the FTC is all in. Thanks, FTC, for cracking down on dealers who use deceptive ads to lure car buyers onto their lots. We're still hoping that the FTC will also curb CarMax's dangerous practices -- including advertising that all its cars must pass a rigorous "125+ point inspection" and only "the best" cars qualify to be sold as "CarMax Quality Certified" cars. When in reality, a lot of the cars they sell have unrepaired safety defects and are being recalled by the manufacturer. Rampid across the country, not with just cars.......everything you buy!!!!!!!!!!! !